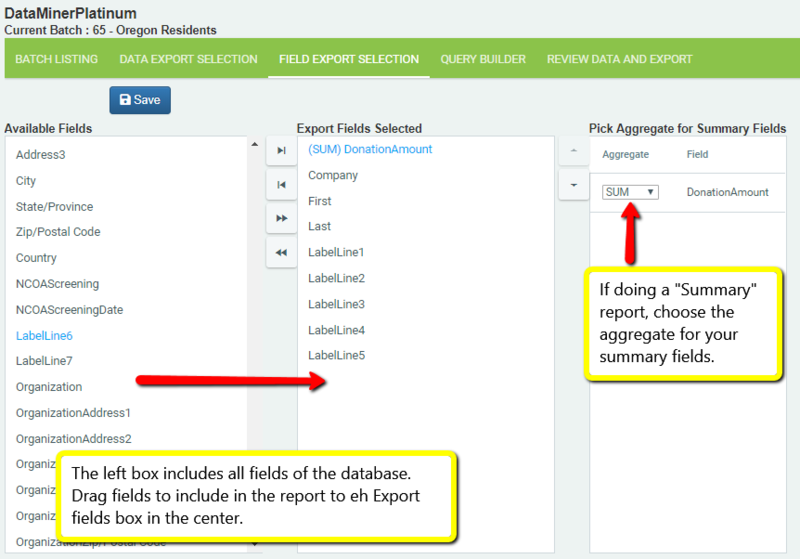 The Field Export Selection tab is where you choose which fields to export to Excel. Your exported spreadsheet will include a column for each field you choose in the order that you have them selected. The first list on the left contains the list of all available field names that are not yet selected for inclusion in the export. This is a list of all the Contact Fields (including User Defined) and all of the fields from the Activity record (if one was chosen). The middle column shows all of the records that have been selected for inclusion in the Excel spreadsheet. Move fields from the Available Column to the Selected Column by using the left/right arrows or by dragging. The final column is only used when building a Summary report. Here, choose an Aggregate for how the program displays the field. For a more detailed explanation read this page.